Look for a few TGF Freedom Fighter offspring in the show ring...THAT IS ALL THE PROOF YOU SHOULD NEED! 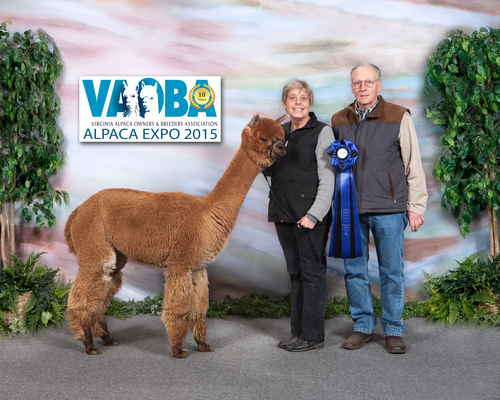 Co Owned with Cabin View Alpaca Farm. Katie is a pleasure to have on the farm. 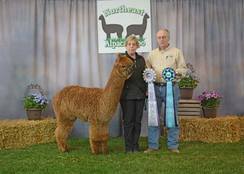 Her sire is 8X Champion STF Jetson who descends from Black Peruvian Royal Forest and Peruvian Dakotia (Bueno). Her Dam Hootalinqua from the Patagonia herd has produced ribbon winning offspring. Kate's fleece is very dense and bright, with excellent coverage. Great conformation with a sweet personality. Forest of Cabin View exhibits all the characteristics desired for an elite/upscale breeding program. His fleece is fine, bright, with a broad crimp and an amazing handle. While it took him a while to "get started" he had an amazing 2017 and 2018 show career - bringing home ~11 banners and as many (or more) 1st place ribbons. What can I say about Claudia Raine!?! She is a beautiful, medium/light brown female, out of our first girl - Kiss Me Kate. Her fleece is extremely soft, with a handle that makes you want to hold on forever, bright and almost wet to the touch. 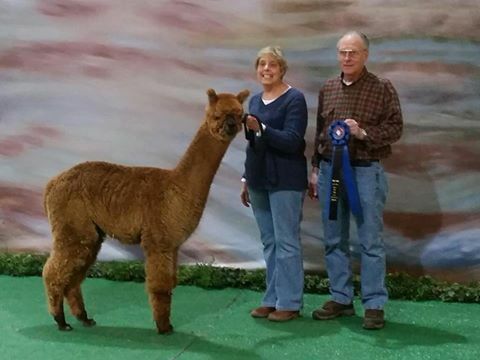 Claudia walked into her first show as a juvi and took 1st in class under the critical eye of Jude Anderson. She had nice things to say about Claudia, including - "WOW, she is sure big for a juvi". as she handed her a blue ribbon. With her easy going disposition, exquisite conformity along with her exceptional fleece - Claudia is a real asset to my foundation herd. Claudia is bred to Forest of Cabin View a handsome Bay Black.